Six ways to stop abusing your enewsletter mailing list — Less Chaos. Less Noise. If you're using your email list exclusively to promote church events, you might be coming across like a disconnected corporate jerk. I'm not saying you are a disconnected corporate jerk, I'm just saying you might look like one. Remember, your email list is full of real people with real lives and busy schedules with inboxes that are already overloaded with sales and promotions from everyone else in the world. Contrary to what you might think, your email doesn't glitter and shine in that list. It gets buried, ignored or deleted. Yes, "email marketing" is still alive and kicking as a huge business tool. But, only if you make a connection with your audience. If you don't make that connection, what you call email marketing is just spam to everyone else. The truth is, people want more from their church than promotional news. They're looking for engagement opportunities. And, if we really want to help and serve our audience, we've got to work harder at delivering something people actually want to open, read and actually use. By sharing a helpful skill with your reader, you're providing value in exchange for an ask (e.g., buy, register, RSVP, volunteer). Need an example? Here's one from Framebridge. What might it look like for you? How about: "Four healthy conversation tips you can use with friends during an election year." Your product is only as good as its reviews: eConsultancy reports that 61% of customers will read a review or testimonial online before purchasing. Harvard Biz reports "each Yelp ratings star translates to 5-9% effect on revenues." Need an example? Here's one from Casper. What might it look like for you? How about: replacing corporate "sales" copy for that next Financial Freedom class or marriage retreat with a couple of one sentence quotes from people who have been there. If it really delivers on the promise you're selling, then your satisfied customers will happily be willing to share their endorsement. When information you share puts the social, fun aspect of content first, your emails encourages its reader to enjoy reading it even if they aren't planning to buy anything in that moment. It's that bonus, fun stuff people relate to. Need an example? Here's one from Chubbies. What might it look like for you? How about: sending blooper reels from the weekend or share awkward family photos of your staff and volunteers as a Christmas themed message. How about you not promote your product or event. It comes across so self-centered. Instead, promote the topics or locations people care about. If you're talking about topics they really care about, they will find their way to your product or event. Need an example? Here's one from Airbnb. What might it look like for you? How about: an email with topical help categories around life stage or circumstance (e.g., anxiety, grief, complicated family relationships, recovery, emotional health, etc.) around different seasons like back to school or holidays. Curate a toolbox or recommended links to articles, books and groups for each category. This is real simple stuff. Save the "fluff" sales pitch (that's already been done) and just send a reminder about a registration deadline. While you're there, you can simply showcase a couple of other events that are still open. Need an example? Skillshare sends a nice reminder to recipients their trial is about to expire. What might it look like for you? I think you can figure this one out on your own. It's not a head scratcher. Make sure your email is friendly, helpful, and straightforward. You know, straightforward like a real letter you'd write to a real person. Need an example? 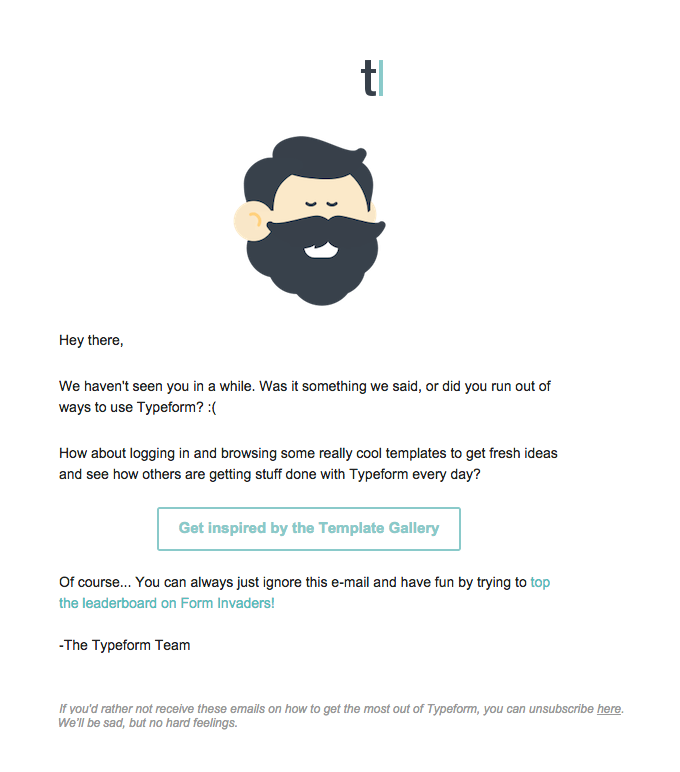 Typeform doesn't ask too much and keeps things relatable and honest. What might it look like for you? How about: sending a short and simple email to people who haven't checked their kids in for a few weeks. Let them know you miss them, ask what's keeping them away (e.g., "Were our Cheerios stale or has your family caught the flu that's going around?") and invite them back for something topically relevant. Be specific. This post was inspired and adapted from an email lead generation article Katherine Boyarsky wrote over at HubSpot. You should check it out. She worked hard to bring a variety of research and data we can learn from.